and have a Code Spotter account. Registration for an Account is free. Entry Dates: Beginning at 12:00:00 a.m. Eastern Time, April 24, 2010 and ending at 11:59:59 p.m. ET, November 25, 2010. How to enter: Visit www.codespotter.com and click on the Log In/Register tab and follow the instructions. Collecting Codes: You will need to collect codes which will be converted to rewards in order to enter the Sweepstakes. During the Promotion Period, Codes will be available for collection at various times from the following locations: television and radio advertisements for Nationwide and NASCAR Nationwide Series™ Racing, outside the host tracks for NASCAR Nationwide Series™ Racing events, at select Nationwide-sponsored events, at participating Nationwide agent offices, in online media including banner advertisements, hidden in five (5) locations on the NASCAR Nationwide Series™ Racing website, and other locations determined by Sponsor in its sole discretion throughout the Promotion Period. After registering/logging in, click on the “Enter Codes” tab on the top of the page and enter the Code(s) where indicated. Upon entry, each Code will be converted into a predetermined number of Rewards ranging in value between 1, 5, 10 and 15 Rewards and deposited into your Account’s Rewards Bank. Certain Codes may be entered multiple times during the Promotion Period. Upon entry of the Code, you will be instructed whether or not the Code may be entered again at a later date during the Promotion Period. Additional Rewards: In addition, additional Rewards may be obtained on the Website by answering daily trivia questions, completing weekly polls, and telling friends about the Promotion each day. For each referral of up to five (5) friends with valid email addresses, you will be given one (1) additional Reward up to a total of five (5) additional Rewards per day. Redeem Rewards: During the Promotion Period, visit the Website and log in to your Account. Click on the “Spend Rewards” tab to see all the available Sweepstakes. Click on the plus (+) and minus (-) buttons below each Sweepstakes description to debit your Account’s Rewards Bank by the number of Rewards corresponding to the number of entries you wish to receive in the applicable Sweepstakes. Each Reward is equal to one (1) entry into the Sweepstakes. You may enter the Sweepstakes for any Entry Period by clicking on the “View Week Of” drop-down field and selecting the Entry Period you wish to view and submit entries into the open Sweepstakes. Entry Limit: You may play the Instant Win Game one (1) time per day. (1) GRAND PRIZE: A trip for two (2) to Charlotte, NC for a NASCAR® Insider Experience. Trip package includes roundtrip, coach-class air transportation for two (2) from a major airport near winner’s home (determined by Sponsor in its sole discretion) to Charlotte, NC; three (3) days and two (2) nights’ accommodations at a hotel determined by Sponsor in its sole discretion (single room, double occupancy); a $300 allowance for full-size rental car for length of stay; a tour of Roush Fenway Racing’s NASCAR Nationwide Series™ racing shop including a meet and greet with drivers Colin Braun, Ricky Stenhouse Jr. and legendary owner Jack Roush; a customized limited edition Jack Roush Stage 2 Ford Mustang; a tour of Roush Fenway Racing’s NASCAR Sprint Cup Series™ racing shop; a meet and greet with Carl Edwards; the opportunity to watch a pit crew practice; a tour of the Roush Racing Museum; a private driving lesson with the Richard Petty Driving Experience; the opportunity to drive on the Charlotte Motor Speedway track in a new Mustang with Roush drivers; and $400 spending money. Approximate Retail Value (“ARV”): $51,400. (4) FIRST PRIZES: A trip for two (2) to Charlotte, NC for a NASCAR® Experience of a lifetime. Trip package includes roundtrip, coach-class air transportation for two (2) from a major airport near winner’s home (determined by Sponsor in its sole discretion) to Charlotte, NC; four (4) days and three (3) nights’ accommodations at a hotel determined by Sponsor in its sole discretion (single room, double occupancy); a $400 allowance for fullsize rental car for length of stay; VIP access at the Charlotte Motor Speedway; a lunch with the team and crew at one of Roush’s haulers on NASCAR Nationwide Series™ race day; a tour of the hauler; a picture with the crew; a meet and greet with Jack Roush; the opportunity to attend a driver’s meeting with the Roush Racing Team; a dinner with the #60 car crew; the opportunity to speak with Carl Edwards crew chief; attendance at pre-race festivities; opportunity to stand with one (1) of the Roush teams during the National Anthem; a picture with a driver by a car; a headset and scanner to watch; the opportunity to watch the balance of the race in the Speedway Club (including food and beverages); and $400 spending money. ARV: $7,188.75. 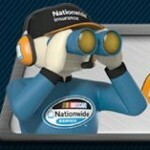 (31) (1 per week): NASCAR Nationwide Series™-themed Driver Prize Package. ARV $50. (31) (1 per week): Signed Die Cast Car by various drivers determined by Sponsor in its sole discretion ARV $25. (31) (1 per week in the event that the NASCAR Nationwide Series does not race that week, a signed hat from the previous week will be used): Victory Lane Hat signed by the winning driver of a NASCAR Nationwide Series™ Racing event. ARV $50. (8) (Awarded weeks of 4/30-5/6, 5/28-6/3, 6/25-7/1, 7/23-7/29, 8/20-8/26, 9/17-9/23, 10/15-10/21, 11/12-11/18): Officially Licensed NASCAR Nationwide Series™ Bar Sign. ARV $279. (8) (Awarded weeks of 5/14-5/20, 6/11-6/17, 7/9-7/15, 8/6-8/12, 9/3-9/9, 10/1-10/7, 10/29-11/4): Blue Draw string bag with visor. ARV $25. (8) (Awarded weeks of 5/7-5/13, 6/4-6/10, 7/2-7/8, 7/30-8/5, 8/27-9/2, 9/24-9/30, 10/22-10/28, 11/19-11/25): Black Draw String bag with a mug. ARV $25. (8) (Awarded weeks of 4/24-4/29, 5/21-5/27, 6/18-6/24, 7/16-7/22, 8/13-8/19, 9/10-9/16, 10/8-10/14, 10/15-10/21, 11/5-11/11): Blanket /Seat Cushion. ARV $25. (2,170) INSTANT WIN GAME FIRST PRIZES (Seventy (70) per week): A $25 NASCAR.COM Superstore gift card. ARV: $25. (31) INSTANT WIN GAME SECOND PRIZES (one (1) per week): A $250 NASCAR.COM Superstore gift card. ARV: $250. I found the code PERFORMANCE on Facebook. I just won a $25 gift card to Nascar.com! Gonna get a birthday present for my son! TIRE works for 10 points found today! Try Codespotter for 15 points and Nationwide for 15 points as well! Won a $25 gc for Nascar.com! Thanks for all the codes. I won a $25 giftcard on instant win. Fun. Carl Edwards won for me. I just won a $25 gift card to Nascar.com! I bought my husband a remote control car! Ty for the heads up Wendy! Won a $25 Nascar.com Gift Card!